Tony Gwynn rookie cards are some of the most important and highly collected baseball cards from the early 1980’s. After all, they were printed during an era when the card companies flooded the market and notoriously drove down values. But in top condition they can still go for hundreds of dollars. As a kid I collected Tony Gwynn cards and had an entire section of my three-ring binder devoted to him. He was one of my favorites and I could only dream of hitting like he could. I still remember that 1994 season when he finished with an incredible .394 batting average…man he could hit! To this day I still think they are great cards. In this guide I go over everything you need to know about collecting Gwynn’s rookie cards. Need help selling sports cards? If you need help selling sports cards but aren't sure where to start, click the button below to learn how I can help! Most vintage stars have only one rookie card to their name. That's generally because there was just one major company printing their cards. From 1952 until 1980, Topps dominated the baseball card market. Other big name companies like Bowman and Fleer had some sets here and there but for the most part Topps was at it alone. That changed in 1981 when Donruss and Fleer got on board. And in 1983, those three companies would all print rookie cards of three future Hall of Famers: Ryne Sandberg, Wade Boggs, and Tony Gwynn. Let's not forget that O-Pee-Chee also printed Gwynn rookie cards making that four in total for collectors to chase. Distinction: This is easily the most sought after of his four rookie cards on this list. But it's neither the rarest nor the most valuable. Because Topps is such a huge name in the hobby, though, most collectors focus on collecting their cards. Number: This is card #482 in a monstrous 792 card set. Design: The 1983 Topps baseball card design is somewhat reminiscent of the 1963 design with the large player image in the center and smaller head shot encircled at the bottom. Only the head shots in 1983 were on the left as opposed to the right sides of 1963 cards. The reverse side of the card was printed horizontally and features his personal information, some Minor and Major League stats and a nice highlight section from his 1982 Major League debut. Condition Issues: The biggest challenge collectors face with this card is centering. Since his card was the last card on the right in the second row of his print sheet, his cards are often miscut and centering suffers as a result. There are also the occasional print marks and bubbles that pop up from time to time. Estimated Worth: In today's market these cards in PSA 10 Gem Mint condition are usually selling between $500 and $700. That's a huge percentage swing so it can be well worth your time to be patient and try to catch one on the lower end of that spectrum. Tony Gwynn was a Hall of Famer and one of the greatest hitters of all-time. Many kids who collected in the 1980's have re-entered the hobby as adults and are once again putting high demand on them. Compared to the Fleer and Donruss versions, Topps draws much more attention and demand from collectors. The condition issues mentioned previously can make it difficult to find these in top grade. Number: Only 392 cards are in the O-Pee-Chee set, half as many as the Topps set, and Gwynn's rookie card is number 143. Design: The overall design of the front of the card is identical to the Topps version except for the O-Pee-Chee logo in the upper right and his position is listed in both English and French in the lower right. The reverse side is also nearly identical except for the O-Pee-Chee logo superimposed over the cartoon image of the batter in the upper left just below his card number. The lower border of the card also denotes it was printed by O-Pee-Chee in Canada. Condition Issues: The card stock and print quality weren't as good as their Topps counterparts. And centering is still a tough challenge. Estimated Value: They don't surface too often but in today's market they're fetching around $1200 in PSA 10 condition, easily around double the price of their Topps counterparts. Far fewer copies were printed making it a scarce card that you'll rarely see. Distinction: This is the Donruss Tony Gwynn rookie card that was part of the company's third major set release after their debut in 1981. Number: The card is number 598 out of a total of 670 cards in the set. Design: Out of the group of Gwynn's rookie cards, I might have to say this is my favorite in terms of design. Since none of them feature a nice action shot of him swinging the bat, which would have boosted its appeal automatically, this one just comes down to personal preference. I like the bat and glove combo they used for the bottom border. And the dark brown, retro Padres jersey he's wearing adds a great touch. The back side of the card is fairly straight forward and contains his personal information along with some stats and career highlights. I like the note in the "Career Highlights" section about how he was one of the best hitting rookies in the NL when he was called up from Hawaii. Little did anyone know then that he'd go on to be one of the game's greatest hitters of all-time. Condition Issues: Centering is generally the biggest challenge as print quality was fairly decent overall. Estimated Worth: In PSA 10 condition these typically sell for around $70-90. It is one of the key mainstream rookie cards of Hall of Famer Tony Gwynn and a key to the 1983 Donruss set. Distinction: This is Fleer's rookie card addition to the hobby of then future Hall of Famer, Tony Gwynn. Number: This is again card #360 out of 661 total cards in the 1983 Fleer baseball card set. Design: The 1983 Fleer baseball card design was very straightforward overall and kind of bland. 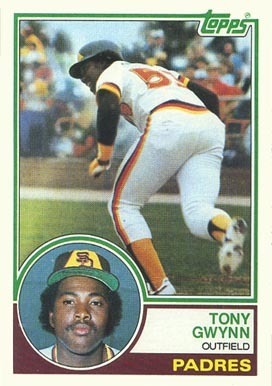 The grey borders don't create much eye appeal in my opinion but Tony in his awesome retro Padres jersey saves it. That Padres logo in the lower left is great, too. The reverse side looks like many Fleer card designs of the day with two-tone coloring within the stat box and a nice "Did you know?" feature along the card bottom. His personal information is also shown and there is a nice headshot of Gwynn in the upper right side of the card--not something you saw too often back then. Condition Issues: The centering on these cards is probably the most common issue but those grey borders also show wear and tear quite easily. The card stock wasn't as good as their Topps counterparts. Estimated Worth: They can go for more from time to time, but generally these sell for around $60-80 in PSA 10 condition. It's Fleer's version of the Tony Gwynn rookie card and a key to set overall. Tony Gwynn goes down in history as one of the game's greatest hitters of all-time. His ability to slap base hits in either direction was nothing short of an art form. He spent his entire 20 year career with the Padres and amazingly only hit below .300 in one of those seasons, his rookie year, which wasn't even a full season. Gwynn would finish with a career .338 batting average, eight batting titles, seven Silver Slugger awards, five Gold Glove awards and appeared in 15 All-Star games. His career was nothing short of incredible and he was one of the game's best offensive players to ever step inside the batter's box. In his first year of eligibility in 2007, Gwynn was inducted into the Baseball Hall of Fame. 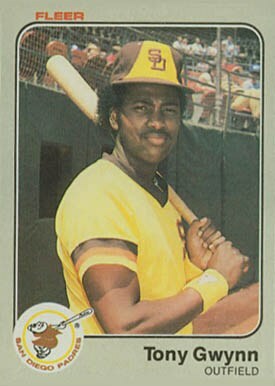 Sadly, Gwynn died of cancer seven years later at the young age of 54.